Then, on July 28, 1918, the Fowler No. 1 well in Burkburnett came in at 3,000 barrels per day – triggering another another boom that brought more companies. The 1940 Academy Award-winning movie with Spencer Tracy and Clark Gable is based on Burkburnett’s oilfield. See Boom Town of Burkburnett. These discoveries further demonstrated the existence of a large petroleum-producing region in the central and southwestern United States – the Mid-Continent, which today includes hundreds of oilfields reaching from Kansas, Oklahoma and Texas into parts of Louisiana and Missouri. Today, the 2,800 residents of this historic oil patch community host an annual Pump Jack Festival celebrating their oilfield’s discovery well. The Mid-Continent field has a long history of oil discoveries and the business booms – and busts – associated with discoveries. The boom at Electra, just south of the Red River border with Oklahoma, came on April 1, 1911. The Clayco Oil & Pipe Line Company’s Clayco No. 1 well erupted oil in a region previously known for its mesquite trees, cotton and cattle. With a total depth of only 1,628 feet, the discovery brought investors and hundreds of exploration companies. “As news of the gusher spread through town, people thought it was an April Fools joke and didn’t take it seriously until they saw for themselves the plume of black oil spewing high into the sky,” notes one North Texas historian. “That day secured Electra’s place in the history books as being one of the most significant oil discoveries in the nation,” proclaims Bernadette Pruitt, a contributor the Dallas Morning News. The Clayco gusher on cattleman William T. Waggoner’s lease settled into production of about 650 barrels per day from 1,628 feet. Hundreds of other shallow-producing wells quickly followed, helping reach the oilfield’s peak production of more than eight million barrels in 1913. A geyser of oil on cattleman William Waggoner’s lease settled into production of about 650 barrels per day from 1,628 feet. Hundreds of shallow-producing wells soon follow. 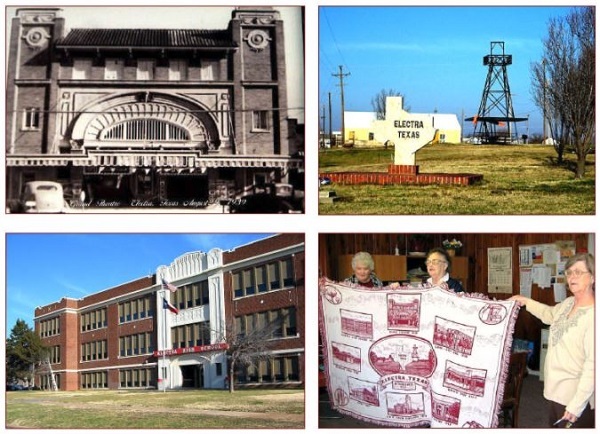 Founded in Wichita County in 1907, Electra was named after the spoiled daughter of cattle baron W.T. Waggoner (according to Texas Monthly, legend has it that Electra once blew $1 million in a single day at Neiman Marcus). The rancher, whose property surrounded most of the town, had complained about finding oil when drilling water wells for his massive herds of cattle. After the discovery the population grew from 1,000 to 5,000 within months of the discovery. But Pruitt explains that the chaos often associated with oil booms was kept to a minimum – because much of the surrounding land had been leased. Many who rushed to Electra seeking quick profits, just as quickly departed. Electra celebrated the centennial of its historic oil discovery with a festival in 2011. The Texas legislature proclaimed the community “Pump Jack Capital of Texas” (there are 5,000 pump jacks in a 10-mile radius). Today the 2,800 residents of this historic oil patch community host an annual Pump Jack Festival celebrating their Clayco well. Highlights include petroleum history photographs exhibited inside Electra’s Grand Theatre; a walking tour of antique oil equipment, including the Clayco well’s boiler; a special Chuck Wagon Gang Lunch and Chili Cook-Off; and educational events for young people. “Electra’ downtown historic Grand Theatre on Waggoner Street has been a community landmark since 1919. Designed by the Ft. Worth architectural firm of Meador and Wolf, it cost $135,000. The Grand once host Vaudeville traveling troupes, silent and talking pictures. Although work remains “to save the Grand,” the theatre was recognized by Texas Historical Commission with Registered Texas Historical Landmark status in 2006 and today hosts community theatre and events. In 1994, Electra’s Grand Theatre became a community fundraising and rehabilitation project; a new floor and handicap accessible entry were completed in 2009. The successive oil booms in Electra, Ranger and Burkburnett resulted in many newly formed companies rushing to North Texas. But as historian Pruitt noted, much of the land already had been leased. Many of the companies would depart or fail. Intense competition throughout the Mid-Continent discoveries made drilling prospects harder to come by. Inevitably, most companies arrived too late. Many went bankrupt without drilling single well. Typical of those seeking quick profits was the Buffalo-Texas Oil Company. It began issuing stock certificates to investors in 1919. Buffalo-Texas Oil Company’s stock certificate includes a vignette of derricks. The very same scene can be found on many certificates from other quickly organized oil exploration companies. Using stock sales to fund drilling was common, but sufficient capital often could not be raised to drill a well – especially as equipment and service prices soared. Some of the company’s certificates cite capital stock of $3 million in 1923 – but the stock issue may have been an unsuccessful effort to raise sufficient venture capital to purchase leases and proceed with exploration. Although the company’s establishment corresponds with a huge post-WW I surge in demand for petroleum, Buffalo-Texas Oil folded in 1928 with a final offer of a half cent per share. The company never drilled a well. Its stock certificate includes a vignette of derricks commonly seen on those of other companies formed (and failed) during the same period: Centralized Oil & Gas, Double Standard Oil & Gas, the Evangeline Oil, the Texas Production, and the Tulsa Producing and Refining Company. Learn more in Is my Old Oil Stock worth Anything?